Great post! 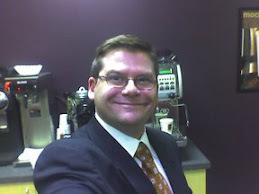 You are the 'Howard' of coffee, and Biggby Coffee makes me as he said it...deliriously happy! 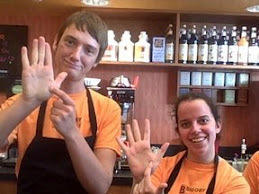 Thanks for sharing, and thank you Biggby for your variety of 'bear' coffee options. First thought when viewing this: Malcolm Gladwell looks like Carrot Top with Dr. J's coiffure and dressed like Steven Jobs. After staring in slack jawed wonder at this most unusual character I decided to try and pay attention to what he was saying. There are two things at the core of his discussion on Howard Moskowitz. First is democratization of taste. In short, The Man can not tell you what to like or what is cool. We get to decide that on our own. And there is no "platonic notion." So The Man can not tell us the way it ought to be. Now, considering the coffee business, guess who stands on the wrong side of this discussion? Why it's the 800 pound gorilla from Seattle. They grew their multinational corporation by saying there was no "ought to be" in coffee. There was more to coffee than Maxwell House and Dunkin' Donuts. But with their success they came to see themselves as the arbiter of cool and the embodiment of the way coffee ought to be. And now the bloom is off their rose, likely forever. And small little companies now get to define new segments of the coffee business and new ways of doing things. So, as much as I am amazed to point this out, Biggby Bob stands on the right side of history. Amazing for a guy who couldn't tell you who was buried in Grant's tomb. The democratization of taste. The realization that there is no "ought to be's." And that the customer is the arbiter of these matters, not the vendor. Not bad, Bob. Not bad at all. Stay humble and don't blow it.